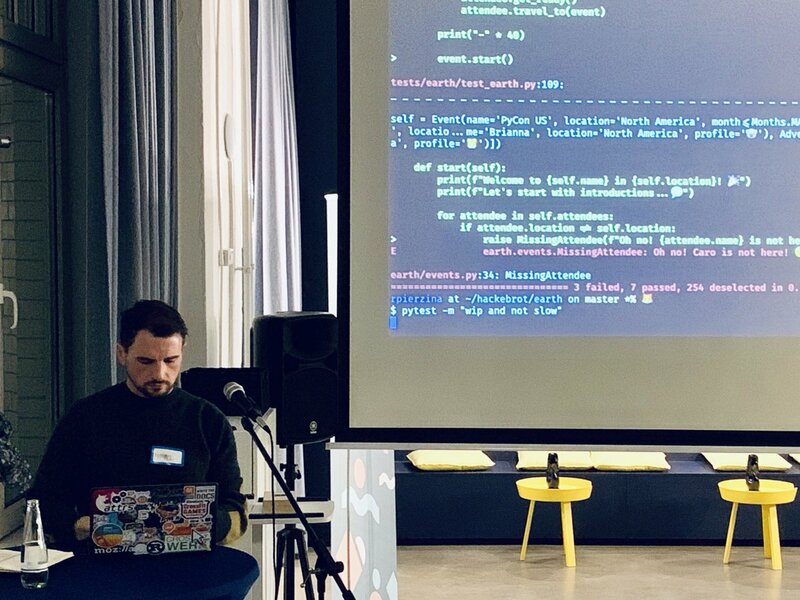 PyBerlin is a new meetup community in Berlin, Germany that strives to be open and inclusive, with talks from a broad range of topics for anyone who is interested in Python. New concepts stick much better with me when applied to a real problem rather than when explained with a bunch of trivial examples. So instead of using a slide deck packed with short code snippets to explain the core concepts of writing tests in Python with pytest, I decided to do some live coding on earth, a small example project, and work on a patch for an open GitHub issue. Earth 🌍 is such an important project, but I’m concerned that without adequate test coverage we may be leaving its users vulnerable. Let’s identify the features that are not yet tested and ensure we can maintain excellent coverage in the future. As we go over these topics, I encourage you to try out the code yourself and follow the links to the documentation if you want to learn more about specific features. I will commit code changes to the earth repository on a separate branch named increase-test-coverage and create commits for the steps in this tutorial. Should you get stuck at any point, please check out the commits on that branch and continue from there. You will find that only tests/year/test_year_02.py imports the earth library, which indicates that the majority of the existing tests do not use the earth library and can’t possibly generate code coverage. Let’s comment out the invalid code, add a comment so that we don’t forget to look into this later and skip the test. # TODO: Can we remove this test? You will see that the test file was skipped and that the test coverage remained at 53%. This means that the test does not generate any code coverage and is safe to skip. The README file in the earth repo contains an example for how the library can be used and the very same example is also copied to the example1.py script. 🐸 Hello, my name is Bruno! 🦁 Hello, my name is Michael! 🐨 Hello, my name is Brianna! 🐯 Hello, my name is Julia! Let’s create a new test file and write a test based on the example. Note that we won’t perform any assertions in our test, but only test for unhandled exceptions. I also recommend to add custom pytest markers to tests that we currently work on as it makes selecting them that much easier. We’ll use happy because our new test will be a happy path test and wip to indicate that this test is a work in progress. Now that we know that the test passes, let’s refactor our code and separate out test dependencies from the test implementation using pytest fixtures and also remove the prints as they are not required for the test. It’s a good idea to check whether adding this test changed the code coverage. This time we will run the tests again and generate an HTML coverage report to find out not only the percentage of lines covered by tests, but also which lines are not executed when we run the tests. The HTML coverage report also shows code coverage for individual files. We can use this information to work on increasing the code coverage for earth even more. The first file in our report adventurers.py has a coverage of 80%. If you click on the link in the HTML, you will see a number of red lines, which means we don’t have coverage for them. We’ll leave the test for the example from the README as is and write a new test for a larger group of adventurers. Rename the fixture friends to small_group and rename the test from test_earth to test_small_group. Create a new fixture large_group based on small_group but return a complete list of adventurers and copy test_small_group to a new test_large_group test. However because we define a function with name small_group in the module scope and everything in Python is an object, Python tries to iterate over our fixture function instead of raising a NameError. I recommend overwriting the auto-generated fixture name to avoid this problem. 🐼 Hello, my name is Po! While the --durations CLI flag might not be super helpful with only two tests and we already knew that the first new test passed in less than one second in a previous run, it’s super useful for larger test suites. slow: tests that take a long time to complete. Now if you run pytest --markers you will see the information about pytest’s markers and also our custom one. We know which test is slow, but we don’t really know why that is. By default pytest captures any output sent to stdout and stderr. Let’s run the slow test again with capturing disabled, so that we see prints while the test runs. Our slow test failed, but let’s focus on the test duration for now. If you tried this out for yourself, you could see that 🐼 Po is eating... 🌱 for several seconds multiple times! pytest -m "wip and not slow"
It’s rather suspicious that the test_no_pandas_group passed, when the only difference to the test_large_group test is that it doesn’t have any pandas. This might be because tests with foxes are flaky and only fail under certain conditions. We can check this by running our tests multiple times with pytest-repeat. Let’s run our fast, wip tests 10 times. We can use the built-in xfail marker from pytest for our flaky test: Tests marked with xfail are expected to fail due to the specified reason. If they fail, they will be reported as XFAIL, however if they unexpectedly pass they will be reported as XPASS. Running all of the tests including the slow test isn’t great for developer productivity. It makes sense to write a custom pytest plugin that skips tests marked as slow by default and only includes slow tests if we run pytest with a custom CLI option. The good news is that pytest comes with a marker which solves this exact problem. Parametrized tests and custom plugins will be our topics in the next part of this tutorial!